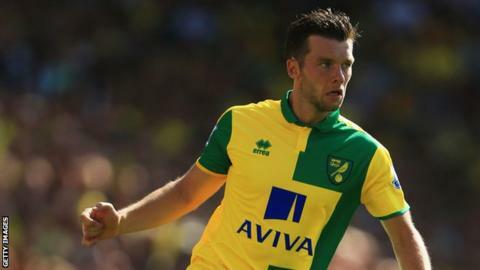 Norwich City are desperate to avoid a repeat of the 2013-14 season that saw them relegated from the Premier League, says midfielder Jonny Howson. The Canaries, promoted from the Championship last term, lost 3-1 on the opening day to Crystal Palace. "The majority of the squad is still here from when we got relegated two years ago," he told BBC Radio Norfolk. "It's not a nice feeling and not something we want to go through again so we'll be giving it our all." Palace went 2-0 ahead in Saturday's match at Carrow Road with goals from Wilfried Zaha and Damien Delaney, before Nathan Redmond pulled a goal back for the hosts. Cameron Jerome then thought he had equalised but controversially had the goal disallowed for a high boot. Ex-Norwich striker Chris Sutton, a pundit on BBC's Final Score, said: "The disallowed goal is the worst decision you will see all season - on the opening day." And Howson says that decision by referee Simon Hooper, officiating his first Premier League fixture, was unexpected. "I was very surprised - I don't think I was the only one," the 27-year-old former Leeds midfielder said. "There was no great appeal, even from their side. Over the course of the season sometimes it will go for you, sometimes it won't. These things happen in football, it's not something we can affect."